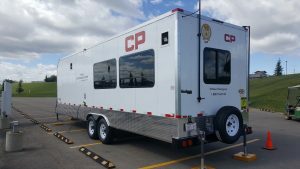 Blackrain has secured a contract to supply emergency response trailers to CP Rail. We delivered the first trailer June 16 2017 to a very receptive and satisfied group. 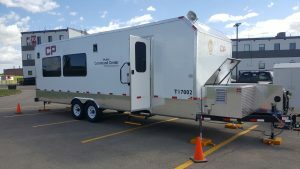 The purpose of these trailers is for the CP response team to be able to establish a base for operations and communications in event of a derailment. Some of the features of these units include a kitchen with fridge and microwave, communications center with cell boosters, 6 work stations, and interior and exterior LED lighting. The first 2 units are scheduled to be delivered to Saskatchewan and Minnesota.